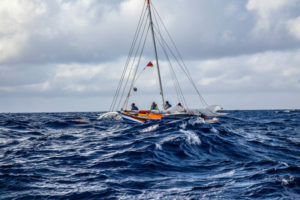 In March 2016 the New York Times published a feature article by Kim Tingley called The Secrets of the Wave Pilots: For thousands of years, sailors in the Marshall Islands have navigated vast distances of open ocean without instruments. Can science explain their method before it’s lost forever? Link to the New York Times story. The Portland newspaper Asian Reporter in October 2015 reported on group of volunteers, led by master Marshallese canoe-builder Tiem Clement, are carving a traditional Marshallese outrigger canoe out of Redwood Sequoia logs this fall at Portland State University (PSU). Time is an old friend of WAM. Link to the Asian Reporter story here. WAM plans to make a BIG splash at the Festival of Pacific Arts in Guam, May 2016. Link to Guam festival site. An Army cadet’s report on his time teaching at WAM. Link to William Ryan’s report. Performance of an Enetawak atoll’s canoe by WAM founder Dennis Alessio. Link to the report. Article by WAM co-founder Dennis Alessio on Cultural Development. Link to the report.